INNOVATIVE’s monthly telephone tracking poll shows the PCs remaining steady in 1st ahead of Liberals and NDP. (Click here for methodology and details). In the 2014 election, Ontario Liberals won with 39% of the vote to PCs 31% with 24% voting NDP. 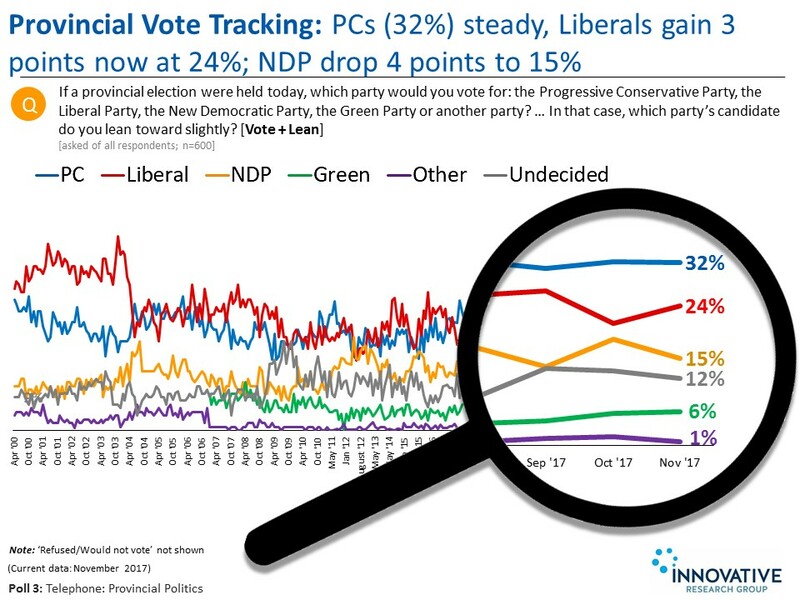 In our latest quarterly tracking the PCs lead with 41% support among decided voters, Liberals are in second at 31%, and the NDP has dropped five points since the election to just 19%. The heat is coming out of the electricity issue in Ontario. 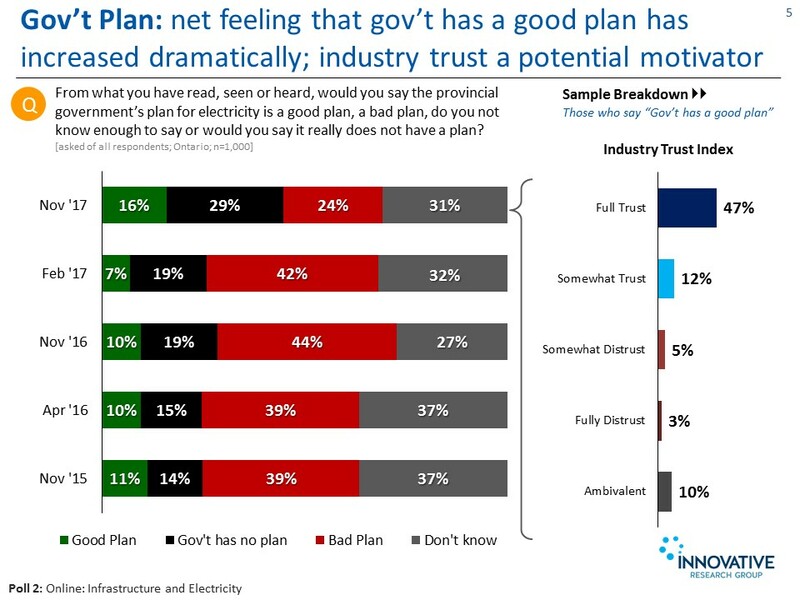 In November 2016, negative feelings were the highest they’ve been since tracking began with more than 2-in-5 (44%) of Ontarians saying that the provincial government’s plan for electricity is a bad plan. As we approach the end of 2017, the proportion of Ontarians who feel the government’s plan for electricity is a bad plan has decreased by 20 points since Nov ’16. Ontarians say they want regulators to lead on decision-making, but at the end of the day will vent their frustrations on politicians. More than half of Ontarians (54%) agree that energy regulators make better choices than politicians because they are the experts in the industry and know the system. That being said, half of Ontarians (51%) agree that if their electricity rates increase to an unacceptable level, they will simply vote the current government out in the next election. The PCs have a real lead but seem to have plateaued with the support of 1-in-3 Ontarians. The Liberals remain in the race because Ontarians hold pluralistic values. However, recently they have been losing moderate Ontarians to the NDP. This effectively strengthens the PCs prospects. On leadership, Wynne is in a deep hole but there is no love-in for her opponents. For the Liberals, dragging Brown down may be easier than lifting Wynne up. As a part of our ongoing monthly tracking, INNOVATIVE maintains regional, voter and issue analyses. For those interested, we offer private briefings, with additional data and depth, specially tailored to the issues that matter to you. To learn more about our INNOVATIVE Insider Briefings, click here. Detailed methodologies are provided in the appendix. It is important to note that margins of error can only be applied to the telephone survey. The online surveys ARE representative samples. We have set targets to ensure we properly reflect key regional and demographic distribution and then used weights to ensure we reflect the country properly. However, since the online survey was not a random probability-based sample, a margin of error cannot be calculated. The Marketing Research and Intelligence Association prohibits statements about margins of sampling error or population estimates with regard to most online panels. For the full report fill out the form below.